“Love me, love my dog” might be the mantra of Schine’s warm and fuzzy seventh novel (She Is Me, 2003, etc.). It’s a romantic-comic roundelay set on and near a quiet, genteel street in New York City’s Upper West Side, near Central Park. 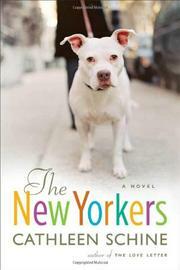 An amiable omniscient narrator introduces us to a neighborhood populated by urban professionals and students and favored by canines and their owners and “walkers.” We first meet music teacher Jody, who deals with the approach of her 40th year and her loneliness by adopting a gentle part–pit bull whom she names Beatrice. Enter Everett, a recently divorced, dashing 50 year old burdened by fraying relationships with his ex-wife and college student daughter—and almost awoken from his lethargic egoism by Jody’s obvious crush on him. Other humans appear, meet, mix, pair up, argue and fight, variously get together or break apart: handsome underachiever George, and his high-energy sister Polly (whose mutt Howdy is employed by George as a chick magnet); “asocial” social worker Simon, whose fixation on fox hunting (in Virginia) slowly yields to his love for Jody; gay restaurateur Jamie, who’s supporting five kids and several ex-boyfriends; intemperate guidance counselor Doris, aflame with plans for “canine reform.” So it goes, a kind of Midsummer Night’s Dream minus the energy and charm. Most of the aforementioned urbanites are moderately interesting people, though none has a tenth of the personality exhibited by Beatrice and Howdy. The novel basically spins its wheels, even during the 2003 blackout, which you’d expect might rouse its characters to some kind of action. Everett does a passable imitation of Jack Nicholson’s character in As Good as It Gets, but the narrative is otherwise very nearly as generic as it gets. Comfy and inoffensive, but lacks bite.